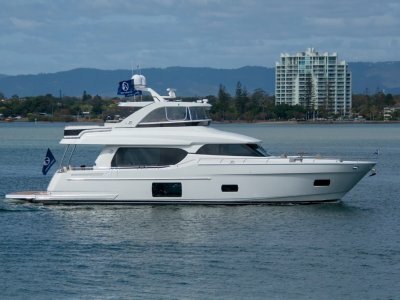 Alexander Marine Australia are pleased to present 'Boonooroo II' to the market as worldwide central agents. Her pedigree is assured with Exterior and Interior design by Guido de Groot. Frisian Shipbuilding constructed her hull and superstructure to Lloyd's Certification. Naval architecture was by Ginton Naval Architects. 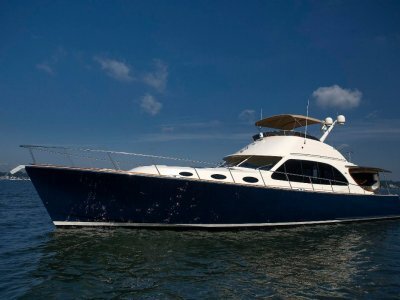 Hence she has been influenced by a powerhouse of respected and iconic European marine industry professionals. 'Boonooroo II' was designed and built in Europe over the course of several years to exceeding standards throughout. Both with respect to her beautiful internal finishes, and importantly her blue water engineering as she is intended to cross the oceans of the world in unsurpassed safety and comfort. 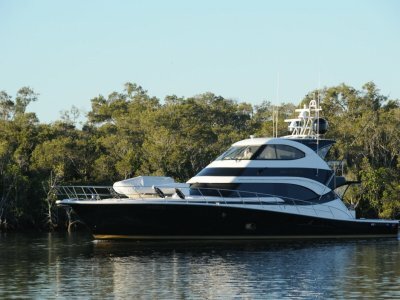 On approaching 'Boonooroo II' you will observe her gleaming paintwork, modern styling and exquisite attention to detail. From the moment you step on board the meticulously laid teak decks feel inviting underfoot. 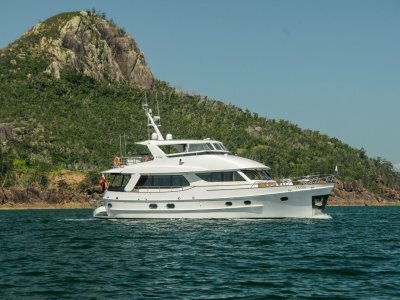 Both the cockpit and expansive flybridge offer entertaining and or dining zones with exceptional views. Aft of the well laid out engine room 'Boonooroo II' features crew accommodation, aft access to the swim platform via a large remote controlled electrically operated garage door, and likewise a spacious crew mess area - complete with the ship's laundry and additional refrigeration. 'Boonooroo II' will sprint to over 20 knots when required, and is stabilized for comfort. Her 12,000 litres of diesel allows for ultra long range cruising and makes her well suited as a private mother ship supporting a sports fishing vessel. She also has provision to carry two tenders for water sports activities. 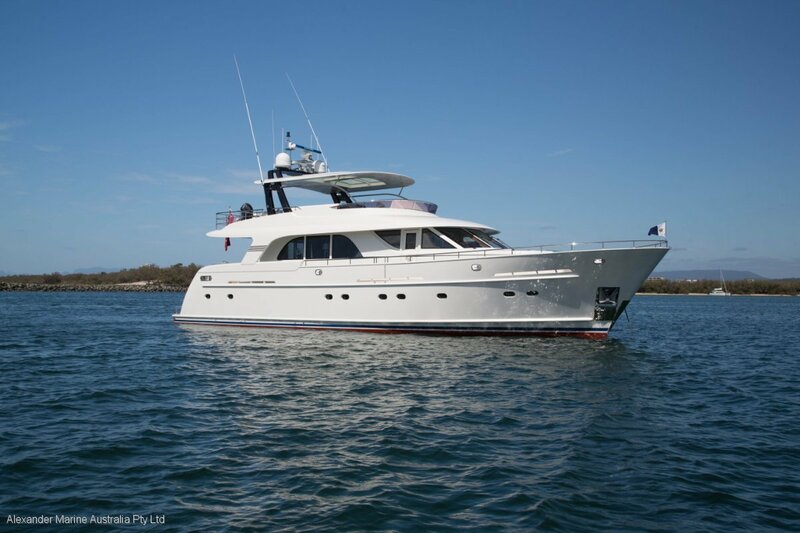 Undoubtedly one of the finest motor yachts in Australia, 'Boonooroo II' presents a rare opportunity for an astute buyer to acquire a heavily customized and meticulously maintained motor yacht in turn key condition ready for her next adventure. Alexander Marine Australia as worldwide central agents welcome your further inquiry. 'Boonooroo II' is offered for sale by expressions of interest. Flat screen TV's. Foxtel. Sound Systems. Dual Muir hydraulic. Dual Muir tailing winches aft. Automatic CO2 fire extinguishers in engine rooom. Emergency bilge suction & fire fighting pump. 12v, 24v, 220v, 230v. Mastervolt chargers and alternators. Furuno TZT2 15" Displays x 3 (Lower Helm). Furuno TZT2 12" Displays x 2 (Flybridge & Crew Cabin). Furuno Remote Control Units for TZTs 15" x 2 (Lower Helm). Furuno DRS 6X Radar with 4ft open array scanner. Furuno FAR2127BB Radar with open array scanner. Furuno RCU-014 Control Unit Keypad. Furuno Nav Autopilot 700 (Lower Helm). Furuno 711-C Autopilot control (Flybridge). Furuno Weather Fax 408 (Lower Helm). Furuno FA-50 AIS. Furuno FI-70 Displays x 4 (2 x Lower Helm, 2 x Flybridge). Furuno Wind Instrument. GPS Navigator GP33 (Lower Helm). KVH Tracphone FB250. Cameras connected to new Furuno screens. Compass. Offshore 3340 Tank(s) Level Indication System. Dual Muir AA560 Chain Counters. Exalto Wiper Controls. Naiad Stabilizers Datum Control. Search Light Control. Fire Detection System Control/Isolation Panel. Caterpillar Engine Digital Instrumentation (Flybridge). Radios: Icom-M801E HF SSB Radio. Dual Simrad RS82 VHF's. Custom flybridge wet bar including BBQ grill. Teak sole. Opacmare Crane (rated to 650kgs). Cockpit wet bar. Naiad Stabilizers with Datum Control. Black water system 1000 litres (approx) with Hamann super mini sewerage treatment plant. Grey water tank 1500 litres (approx). All windows are double glazed. Crew Quarters mess contains Miele appliances including additional refrigeration for extended cruising. Anti-foul and propspeed November 2017. A stunning vessel in outstanding condition.